Natural heme proteins may have heme bound to poly-peptide chain as a cofactor via noncovalent forces or heme as a prosthetic group may be covalently bound to the proteins. Nature has used porphyrins in diverse functions like electron transfer, oxidation, reduction, ligand binding, photosynthesis, signaling, etc. by modulating its properties through diverse protein matrices. Synthetic chemists have tried to utilize these molecules in equally diverse industrial and medical applications due to their versatile electro-chemical and optical properties. The heme iron has catalytic activity which can be modulated and enhanced for specific applications by protein matrix around it. Heme proteins can be designed into novel enzymes for sterio specific catalysis ranging from oxidation to reduction. These designed heme-proteins can have applications in industrial catalysis and biosensing. A peptide folds around heme easily due to hydrophobic effect of the large aromatic ring of heme. The directional property of co-ordinate bonding between peptide and metal ion in heme further specifies the structure. Therefore heme proteins can be easily designed for targeted structure and catalytic activity. The central aromatic chemical entity in heme viz. porphyrin is a very ancient molecule. Its presence in the prebiotic soup and in all forms of life suggests that it has played a vital role in the origin and progressive evolution of living organisms. Porphyrin macrocycles are highly conjugated systems composed of four modified pyrrole subunits interconnected at their α -carbon atoms via methine (=CH−) bridges. Initial minimalist models of hemoproteins focused on effect of heme-ligand co-ordinate bonding on chemical reactivity, spectroscopy, electrochemistry and magnetic properties of heme. The great sensitivity of these spectroscopic features of heme to its surrounding makes them extremely useful in structural elucidation of designed heme-peptide complexes. Therefore heme proteins are easier to work on for designing novel proteins for industrial and medical applications. Keywords: Heme protein, Designed protein, Heme-peptide complex, designed heme-protein, mini-protein, soret band, hemeligation. Keywords:Heme protein, Designed protein, Heme-peptide complex, designed heme-protein, mini-protein, soret band, hemeligation. Abstract:Natural heme proteins may have heme bound to poly-peptide chain as a cofactor via noncovalent forces or heme as a prosthetic group may be covalently bound to the proteins. Nature has used porphyrins in diverse functions like electron transfer, oxidation, reduction, ligand binding, photosynthesis, signaling, etc. by modulating its properties through diverse protein matrices. Synthetic chemists have tried to utilize these molecules in equally diverse industrial and medical applications due to their versatile electro-chemical and optical properties. The heme iron has catalytic activity which can be modulated and enhanced for specific applications by protein matrix around it. Heme proteins can be designed into novel enzymes for sterio specific catalysis ranging from oxidation to reduction. These designed heme-proteins can have applications in industrial catalysis and biosensing. A peptide folds around heme easily due to hydrophobic effect of the large aromatic ring of heme. The directional property of co-ordinate bonding between peptide and metal ion in heme further specifies the structure. Therefore heme proteins can be easily designed for targeted structure and catalytic activity. The central aromatic chemical entity in heme viz. porphyrin is a very ancient molecule. Its presence in the prebiotic soup and in all forms of life suggests that it has played a vital role in the origin and progressive evolution of living organisms. Porphyrin macrocycles are highly conjugated systems composed of four modified pyrrole subunits interconnected at their α -carbon atoms via methine (=CH−) bridges. Initial minimalist models of hemoproteins focused on effect of heme-ligand co-ordinate bonding on chemical reactivity, spectroscopy, electrochemistry and magnetic properties of heme. The great sensitivity of these spectroscopic features of heme to its surrounding makes them extremely useful in structural elucidation of designed heme-peptide complexes. 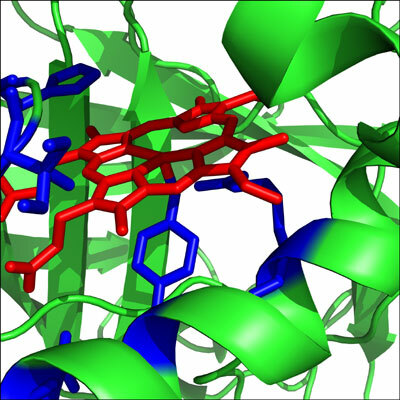 Therefore heme proteins are easier to work on for designing novel proteins for industrial and medical applications.